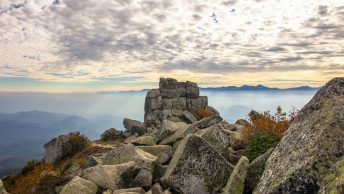 For those looking to gain some hiking experience, tackling the main ridgeline which runs between Musashi-Itsukaichi Station and Okutama Station is a great place to begin. Its proximity to downtown Tokyo means the trails are popular, clearly signposted and generally well kept up. This hike along the Tarukubo Stream タルクボ沢 is no exception. At Musashi-Itsukaichi Station head over to bus stop 3 and jump on any bus heading for Matsuo 松尾. Alight at the Shiraiwataki bus stop 白岩滝バス停 (15 mins, 350 yen). Earlier the better as even the 7:10 am bus filled up quickly. The first kilometre to the Shiraiwa Falls follows a narrow-paved road. Just before the trail proper there is a restroom, but you will need to bring your own water. The Tarukubo Stream comprises 18 waterfalls including three separates falls which make up the Shiraiwa Falls, nestled in the lower reaches. The picturesque Shiraiwa no taki recreational trail 白岩の滝遊歩道 grips the river bank, apart from one spot where it cuts across a paved road. After 45 minutes of moderate climbing from the trailhead you’ll arrive at a sign pointing to Mt. Asoyama 麻生山 (794 m). Once you reach the Konpira Ridge 金比羅尾根 the actual mountaintop is a short distance up on your left. If you look back along the trail you should be able to pick out Mt. Hinodeyama 日の出山 (902 m) in the distance. This path is well trodden and takes another 45 minutes to reach the summit. The last time I came here via the infamous Hinodeyamakita Ridge 日ノ出山北尾根 the summit was teeming with hikers, I had expected much the same given the glorious sunshine but surprisingly there was only a handful of us. After wolfing down an early lunch, I wasted little time getting back on the trail. The map time allots 90 minutes back to the bus stop however it shouldn’t take much more than an hour at a steady pace. From the summit return to the trail branch and head towards the Tsurutsuru-onsen つるつる温泉. Before hitting the paved road and a small shrine at Takimoto, the trail makes a series of twists and turns through what is a rather nice forest. Follow the bitumen until you reach the main road, turn left and it’s a 5-minute walk up to the hot spring where a garishly themed bus makes the return trip to Musashi-Itsukaichi Station.